With over 25 years of experience, VITEC is the leader in designing and implementing embedded video solutions in both military and civilian markets. VITEC offers a complete line of products focused on real-time encoding, streaming, dissemination and archiving of full-motion-video content with ISR metadata. VITEC provides off-the-shelf hardware for system integrators as well as custom-made. Product ranges include rugged and lightweight video encoders, streaming appliances and a comprehensive software suite for viewing and disseminating live and on-demand ISR footage to local users as well as remote users. 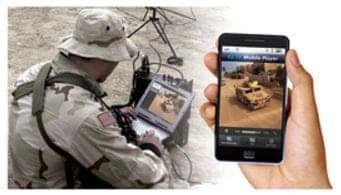 VITEC’s portable encoders family are installed in mobile platforms from UAVs to forward reconnaissance vehicles and hand-carried by tactical units to quickly capture video data and deliver it seamlessly over LAN’s, WAN’s , IP radio and even satellite and 3G/4G connections. VITEC portable encoders combine high quality, low latency H.264 encoding with a wide spectrum of video input formats – all packed in light weight, rugged enclosures with best-in-class power requirements. 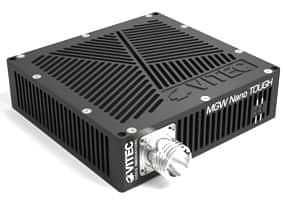 All of VITEC’s MGW Portable encoders support KLV/STANAG Metadata injection over serial, SDI or IP connections. VITEC’s family of portable encoding and streaming appliances are MIL-STD certified for harsh mechanical and environmental conditions. 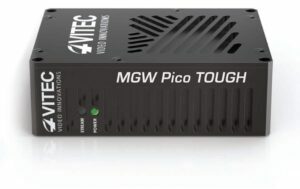 MGW Pico TOUGH is the world’s smallest, most power-efficient MIL-STD certified MPEG-4 H.264 HD/SD video encoder. It encodes and streams real-time video with frame-accurate metadata from any video source. MGW Pico TOUGH’s fanless, pocket-size enclosure is designed for use on unmanned and manned vehicles, in fly-away kits or hand-carried in extreme conditions. The MGW Nano TOUGH is a lightweight rugged video encoder certified to MIL-STD and capable of up to 1080p HD encoding and streaming. It features super HD/SD H.264 video compression, metadata pass-through, resolution scaling, motion stabilization, and full SDK for integration with third-party command and control applications. Input options include 3G, HD/SD-SDI, Composite and HDMI. The solid-state system weighs under 2lbs, requires only 10W for full HD streaming and meets MIL-STD704 and MIL-STD 38999 certifications. World’s smallest 1080pHD H.264 FMV encoder, the MGW Pico is the size of a deck of cards and has been deployed with individual soldiers to collect ISR data in the field as well as integrated to various manned and unmanned ground, aerial and marine vehicles. 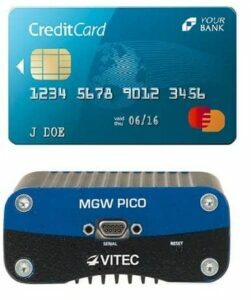 MGW Pico is offered with its rugged, MIL-STD certified enclosure or as an OEM/Integration PCB for optimized integration into third-party systems. Input formats include Composite RS-170 or HD/SD-SDI video. Processing capabilities include full support of MISB KLV metadata and wide range of resolution, frame rate and bit-rate settings allowing optimization of the IP video stream to any network. VITEC’s cutting-edge, Full Motion Video (FMV) solutions deliver real-time and on-demand video to PCs, TVs and Mobile Device screens – anytime, anywhere and on any network. Designed for mission critical applications, VITEC’s FMV solutions facilitate informed decision-making and faster response to operational challenges. VITEC’s battle-proven FMV solutions allow military personnel to easily disseminate live feeds and recorded video assets in various bit-rates optimized for the specific network link available. Organizations can leverage existing IP network infra-structure to distribute video to LAN and WAN users. Smart integration with IT security systems and existing domain policies enable system admins to regulate access to video content dynamically eliminating the need to use complex firewall and network routing settings. Conformance with DISA and JITC guidelines allow for rapid integration and into network architecture. FITIS provides recording, indexing and distribution of STANAG compatible streams. Real-time actionable FMV intelligence including historical operations archives to support decision making. Enhanced processing, indexing, exploitation and dissemination of motion imagery provides continuous, reliable and cost-effective archiving of FMV streams with metadata. On the technical side, easy integration with deployed FMV and IT equipment helps with setting up secure IP-based access to real-time situational awareness video. VITEC specializes in Military UAV streaming (with embedded KLV), live C4ISR streaming, and Media Asset Management solutions for civilian or military organizations. All VITEC encoders are available in boxed or board form factors for off the shelf integration. Smaller UAV and vehicles with tight form factor and power constraints benefit from VITEC’s 25 years expertise in designing custom products for mid quantities with a unique engineering service offering, guarantee of long term product availability and maintenance. By submitting this form, you consent for your details to be sent to VITEC and its authorized partners in order to respond to your inquiry. Depending on the location of the organization, your personal information may be transferred and processed outside of the European Economic Area.